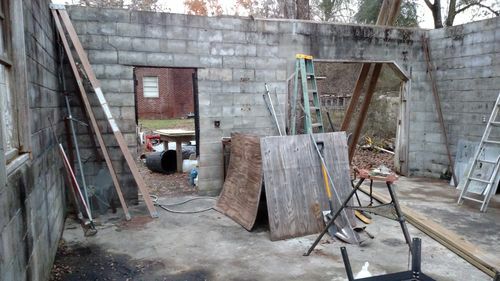 I moved here about six years ago and turned the my carport into a shop but I need more room now. 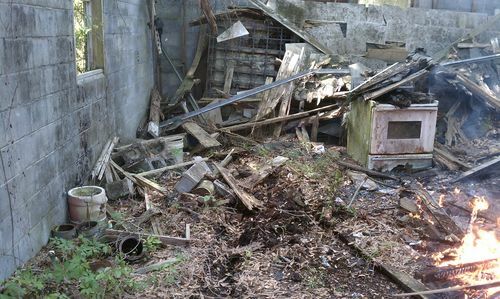 There is a block building (24×24) on my property but years before a tree fell though the roof. Nobody repaired it so it sat for years in the elements. 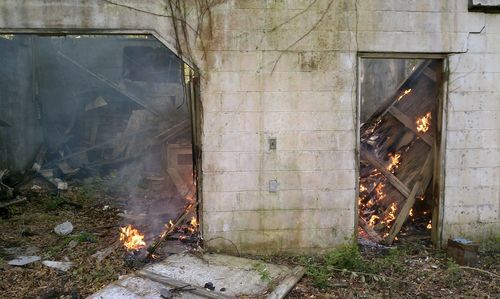 It was also over run with vines and it had trash in it. 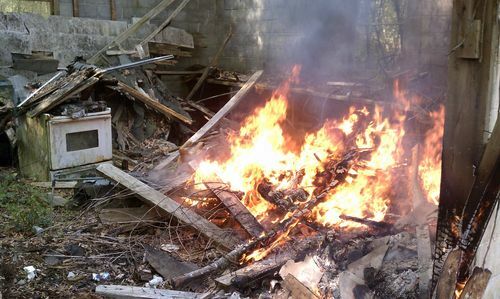 I decided to burn the inside old wood and trash so I could clean it out. Then I repaired the damaged block around the top and poured concrete in the block for strength. 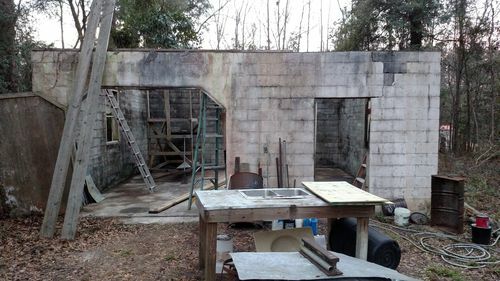 This is going to be my new shop after the roof is installed. -- If it ain't broke don't fix it, if you fix it make it better than it has to be. WOW dude … this is going to be a pretty dramatic before/after! Work safe, good luck, and looking forward to watching some progress! I hope you keep the oven it looks like a good piece of gear for the new shop Just the shot for a pie or hot dog ! 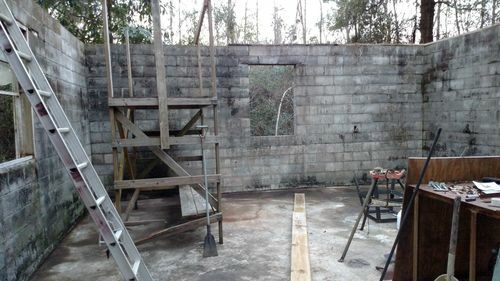 Make sure you get a door in soon so it dosnt become a home for deer !! You should have kept that bike too! 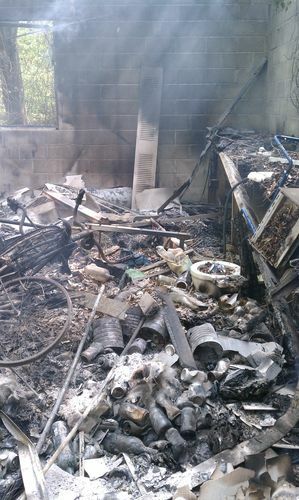 Now THAT is how you clean out an old barn! Well done. I look forward to more posts. I really need to figure out how to start a blog here for my shop build. -- Jeff ~ Tacoma Wa. That’s got the makings of a nice shop. Keep up the good work and post the progress. I see old buildings like this all the time and thought that it would be nice to redo them. It turned out to be one heavy duty home and so will your shop. Looking forward to this build. Good luck with the build out. Looks like a lot of work, but a suitable structure to build on. Is the concrete pad a new pour? or was it hiding under all the wreck. I wonder if the tree blew down during Hugo? I was stationed at the navy base in Charleston shortly after and the destruction was incredible…. with entire forests blown down flat. And the moral of the story is, friends, don’t keep shallow rooted trees close to your buildings…. especially in Hurricane country. Yes, I put rebar in the blocks and existing slab.